11 As Ds transposes, it leaves the C allele, restoring the allele's function. 12| A cell in which Ds has transposed out of the C allele will produce pigment, generating spots of color in an otherwise colorless kernel. 111.29 Transposition results in variegated maize kernels. Conclusion: Variegated corn kernels result from excision of Ds elements from genes controlling pigment production during development. As development takes place and the original one-celled maize embryo divides by mitosis, additional transpositions may take place in some cells. In any cell in which the trans-posable element excises from the Ct allele and moves to a new location, the C allele is rendered functional again: all cells derived from those in which this event has taken place will have the genotype Cc and be purple. The presence of these pigmented cells, surrounded by the colorless (Ctc) cells, produces a purple spot or streak (called a sector) in the otherwise yellow kernel ( FIGURE 11.29d). The size of the sector varies, depending on when the excision of the transposable element from the Ctc allele occurred. If excision occurred early in development, then many cells will contain the functional C allele and the pigmented sector will be large; if excision occurred late in development, few cells will have the functional C allele and the pigmented sector will be small. 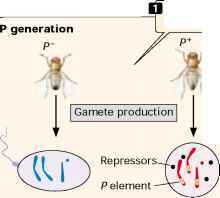 Transposable elements in Drosophila A number of different transposable elements are found in Drosophila. One of the best studied is copia, a retrotransposon about 5000 bp long (< Figure 11.30). Copia has direct (i.e., not inverted) repeats of 276 bp at each end, and within each direct repeat are terminal inverted repeats. When copia transposes, it generates flanking direct repeats that are 5 bp long at the site of insertion. Like Ty elements, copia contains sequences similar to those found in the gag and pol genes of retroviruses (see Figure 8.36). The number of copia elements in a typical fruit fly genome varies from 20 to 60. 11.30 Copia is a transposable element of Drosophila. able elements in bacteria, P elements transpose through DNA intermediates. Each element encodes both a trans-posase and a repressor of transposition. The role of this repressor in controlling transposition is demonstrated dramatically in hybrid dysgenesis, which is the sudden appearance of numerous mutations, chromosome aberrations, and sterility in the offspring of a cross between a P+ male fly (with P elements) and a P female fly (without them). The reciprocal cross between a P+ female and a P male produces normal offspring. Hybrid dysgenesis arises from a burst of transposition that takes place when P elements are introduced into a cell that does not possess them. A cell that contains P elements produces the repressor in the cytoplasm that inhibits transposition. When a P+ female produces eggs, the repressor protein is incorporated into the egg cytoplasm, which prevents further transposition in the embryo and thus prevents mutations from arising. The resulting offspring are fertile as adults (FIGURE 11.31a). However, a P females does not produce the repressor; so none is stored in the cytoplasm of her eggs. 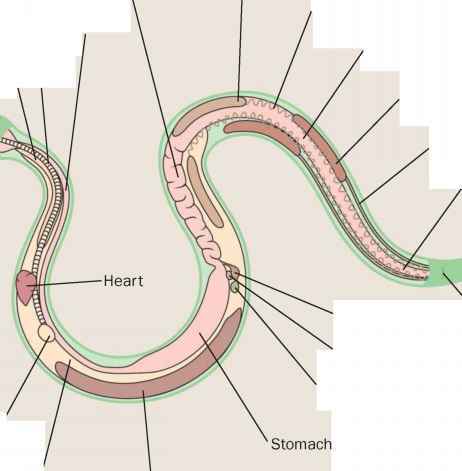 When her eggs are fertilized by sperm from a P+ male, the absence of repression allows the P elements contributed by the sperm to undergo rapid transposition in the embryo, causing hybrid dysgenesis ( FIGURE 11.31b). P elements appear to have invaded D. melanogaster within the past 50 years. Today, almost all D. melanogaster caught in the wild possess P elements, but these transposable elements are uncommon in laboratory colonies of flies that were established more than 30 years ago. In fact, no strain of D. melanogaster collected before 1945 possesses them, suggesting that P elements have recently invaded D. melanogaster and have spread rapidly throughout the species. Because P elements are not present in most laboratory stocks, they have been useful experimentally as vectors for introducing modified or foreign DNA into the Drosophila genome. P elements have been extensively manipulated and engineered for a variety of uses. If P elements are a recent addition to the genome of D. melanogaster, where did they come from? A likely source is Drosophila willistoni, another fruit fly species. D. willistoni appears to have long possessed P elements that are virtually identical with those now found in D. melanogaster. Researchers Marilyn Houck and Margaret Kidwell proposed that the P elements made the leap from D. willistoni to D. melanogaster by hitching a ride on a mite. All fruit flies are infected with a variety of mites. One mite species, Proctolaelaps regalis, infests both D. willistoni and D. melanogaster. This mite has needlelike mouth parts that allow it to pierce and feed on the eggs and larvae of the flies. Houck and Kidwell suggest that, while feeding on D. willistoni, a mite picked up fruit fly DNA with P elements, which it later injected into a developing D. melanogaster. This hypothesis is supported by the finding that mites do pick up P element DNA from P+ fruit flies. Transposable elements in humans Almost 50% of the human genome consists of sequences derived from trans-posable elements, although most of these elements are now inactive and no longer capable of transposing. One of the most common transposable elements in the human genome is Alu, named after a restriction enzyme (AluI), which cleaves the element into two parts. Every human cell contains more than 1 million related, but not identical, copies of Alu in its chromosomes. Unlike the retrotransposons we have described earlier (Ty elements from yeast and copia elements from Drosophila), Alu sequences are not similar to retroviruses. They do not have genes resembling gag and pol, and are therefore nonautonomous. Rather, Alu sequences are similar to the gene that encodes the 7S RNA molecule, which transports newly synthesized proteins across the endoplasmic reticulum. Alu sequences create short flanking direct repeats when they insert into DNA and have characteristics that suggest that they have transposed through an RNA intermediate. Alu belongs to a class of repetitive sequences found frequently in mammalian and some other genomes. These sequences are collectively referred to as SINEs, (short interspersed sequences). The human genome also has many LINEs (long interspersed sequences), which are somewhat more similar in structure to retroviruses, but not as similar as Ty or copia. The human genome contains evidence for several classes of transposable elements that transpose through a DNA intermediate, by the cut-and-paste mechanism. However, these all appear to have been inactive for about 50 million years; the nonfunctional sequences that remain have been referred to as DNA fossils.